If you're looking for clean, responsive & SEO friendly Blogspot Template, then krove personal blogger theme is excellent choice for your personal blog. 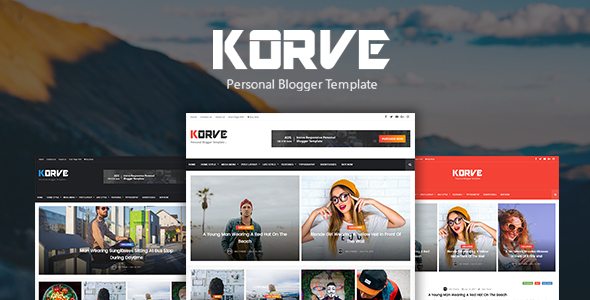 Korve is a modern, clean, elegant and Personal Blogger Template which is specially designed for creative bloggers. It provides clean, clutter-free and gorgeous minimalistic layouts that make your content look great on any kind of device. This template is ideal for personal, lifestyle blogger blogs. Mix-Theme made this attractive Blogger Template, which mainly designs for Personal & lifestyle blogs. It comes with many cool features like Easy to Customize, Featured Posts Slider With Two Properties, Live Customizer, Mobile Friendly Design and much more. So if you're planning to make a blogger blog on Blogspot Platform, then this template is an excellent choice for your personal blog. 3 Post Styles: Stander, Cover Post Image, Favorite image. 6 Custom Label on Main Menu and Posts: HOT, NEW, TRENDING, EXCLUSIVE, UPDATE. Useful Shortcodes Built-In: Contact Form, Buttons, Alert Box. Post Formats Icon: Standard, YouTube, Vimeo, Instagram, Facebook, Twitter, Map, Soundcloud.